Contains All 23 Action-Packed Episodes from the Third Season, Plus All-New Featurettes, Commentaries, Deleted Scenes, and a Gag Reel! 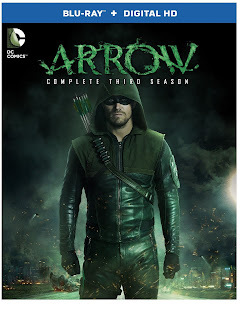 Just in time for Arrow’s fourth season on The CW, viewers can catch up with the action-packed series as Warner Bros. Home Entertainment and DC Entertainment release Arrow: The Complete Third Season on Blu-ray and DVD on September 22, 2015. Averaging 4.2 million viewers weekly for each original episode, Arrow is The CW’s #2 show among Total Viewers, behind only The Flash! The release contains all 23 thrilling episodes from the third season that will have you on the edge of your seat, plus almost three hours of extra content, including episode commentaries, featurettes, deleted scenes, and a gag reel. Arrow: The Complete Third Season is priced to own at $59.98 SRP for the DVD and $60.10 SRP for the Blu-ray.